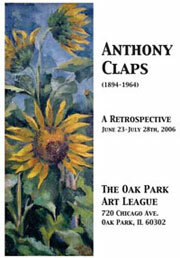 Oak Park, IL (May 12, 2006) - “These are really beautiful,” said Joel Dryer, art collector and director of the Illinois Historic Art Project, as he viewed the paintings by the late Chicago artist Anthony Claps whose treasures have not been seen for 42 years. In his seventy years, from 1894 to 1964, Anthony Claps produced hundreds of works of art and sold many. He studied at New York's Roycroft Campus, the Art Institute of Chicago and with abstract artist, Hans Hoffman. In the last two years, Claps family members have made a concerted effort to find and document all of the known paintings of their prolific patriarch. In a painstaking but highly rewarding process, they have identified over 250 paintings, and a dozen samples of his leathercraft work, in Illinois, Florida, California and other states. One astonishing find was twenty-five orphaned paintings in the crawlspace of a relative's home. Most were in excellent condition and many will be in the exhibit. In what started out as a nostalgic tribute to Tony, the family is thrilled that the Oak Park Art League (OPAL), where Claps was a beloved teacher, has agreed to host the fifty-piece “Anthony Claps Retrospective.” After Claps' death in 1964, OPAL hosted a memorial exhibit, which was the last time any of his work was seen in public. From June 23rd to July 28th, the public will once again have the chance to see his work. Never one to sing his own praises, the quiet, peaceful Claps would be pleased with his family's effort. “I can see his sly, knowing grin,” says Anthony's granddaughter, Susan Yackley, who recently located an original Claps painting six miles from her home in Los Angeles. The opening reception for this exhibit will be held on Friday, June 23rd at the Oak Park Art League from 6:00pm to 9:00pm. Everyone is invited to view these beautiful rural landscapes, city scenes, and florals, which can once again be shared with the world. Only four of the fifty paintings will be for sale. The Oak Park Art League is located at 720 Chicago Avenue in Oak Park, IL 60302. OPAL is partially funded by grants from the Oak Park Area Arts Council and the Illinois Arts Council, a State Agency.